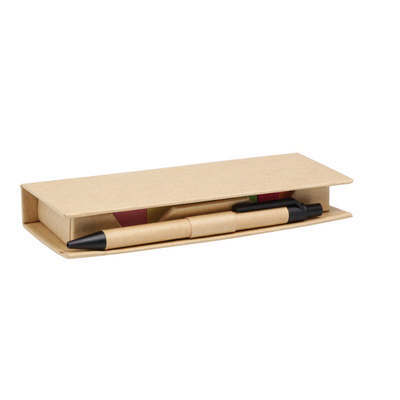 Eco recycled cardboard stationery set. 12cm ruler. Black ink recycled cardboard pen. Five different colour sticky flags. Two different colur sticky notes. Product Size: 160 x 64 x 22mm. Product Packing: Bulk packed. Decoration Size: Screen 140 x 50mm, Pad 60 x 30mm. Decoration Position: Front cover. Decoration Method: Pad Print. Carton Quantities: 100. Carton Size: 36 x 35 x 28. Carton Weight: 12. Colour: Natural. Price includes: See drop down menu for decoration options.